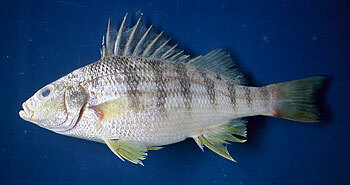 The barred grunt occurs from the northern Gulf of Mexico through the Caribbean to Brazil. Adults inhabit deeper waters (up to 100 m) over rock or coral bottoms during the day but move inshore during the night to feed. Juveniles remain primarily in estuaries or nearshore seagrass beds. This species reaches maturity by its second or third year and reaches an estimated maximum age of 10 years.Grunts possess prominent pharyngeal teeth. Stridulation of the pharyngeal teeth produces sounds which are then amplified by the swim bladder. These sounds may be associated with feeding but can also function as a fright responsewhen the fish is captured, handled or otherwise distressed. Both males and females produce sounds.